My wife and I have differing opinions about sourdough--I like it tangy, she likes it mild; sandwich bread--I like its crumb chewy, she likes it soft and fluffy; and biscotti--I prefer parmesan cheese, and black pepper, she craves ameretto-almond. But when it comes to baguettes we are 100% in accord: wheaty flavor, lightly chewy, open crumb, crackling crust. And in that order. I've spent nearly two years working on a formula, and a process that yields what we want. I've learned quite a few things about baking in general, and baguettes in particular. I've also relearned a few lessons about myself. In this moment, I think I've reached the semi-experienced novice level--somewhat akin to the Sorcerer's Apprentice. Please, this is just my offering of what I've found works for me. Here's what I've learned about a formula: use quality ingredients; don't obsess over the quality. Flours:I've lusted over descriptions of French milled flours, King Arthur's French-style, and Guisto's artisan flours: lusts never realized. It's simply a cost decision. I use King Arthur's super-market accessible, all-purpose flour. I've made a couple of excursions into other brands, with consistent disappointment. One brand's flavor was really nasty. Salt: I use sea salt, purchased in bulk from a local organic food store. It's ridiculously inexpensive. My children, knowing my Foodie obsessions have gifted me, more than once, with Sal de Very Expensive. I've used it. I can't discern a difference; neither can my wife. Yeast: SAF: as little as possible. Flour (one kind), salt, water, yeast: it doesn't get any simpler than that. Process: Herein, I've learned the biggest lessons. K.I.S.S.--Keep it Simple, Stupid! (I learned this, the first time, from a Navy Chief Petty Officer, when I was a bottom-of-the-ladder Seaman)--outpaces them all. A few general lessons: These support K.I.S.S. Keep notes: what you used, what you did, what you changed, what you forgot, what resulted, what you're going to do next. Also, at the beginning of a follow-on bake review your previous notes, and write down what you're going to do. Underline the change(s). These are the things that work for me, with K.I.S.S. always in mind. I marvel at the time and effort other TFL'ers put into baking baguettes. I'm certain their results make my baguettes reminiscent of dog biscuits. Nonetheless, we (my wife and I) are happy with our results, so far, and the neighbors make complementary noises with their mouths full. Flavor develops during fermentation: Yes, you've got to use ingredients you trust. They have to be capable of giving good flavor, but it's fermentation that exploits those qualities. Up to a point, retarded (chilled) fermentation develops flavor proportionate with the fermentation duration. I don't know what that point is. I've learned I get desirable flavor between 15 hours and 21 hours of retarding at 54°F. Furthermore, the desired flavors are more present after 21 hours compared to 15. hours. I'm fortunate to have a wine closet wherein the temperature is maintained at 54°F. I've not attempted retarding in a refrigerator--most home fridges are 38°F-40°F--but from reading TFL other bakers are having great successes. Hydration differences don't seem to change the flavor profile significantly, or, at least, not as significantly as retardation time. I've investigated from 65% hydration to 72% hydration. Arguably, the more flour, slightly more flavor in that Hydration range, whereas, 15 hour retardation yields an excellent flavor, 21 hours a bigger excellent flavor. Open crumb structure improves with retarded fermentation. I'm fairly sure this is accurate, however, mishandling can massacre the gain. Don't ignore DDT. It gives one a finer control over results from retardation. Don't think of DDT as just small adjustments to room temperature water to hit the "magic" 76°F or 80°F. Pre-chill the formula's flour and use ice water in the dough's prep, to bring the mix to the planned chill temperature immediately. 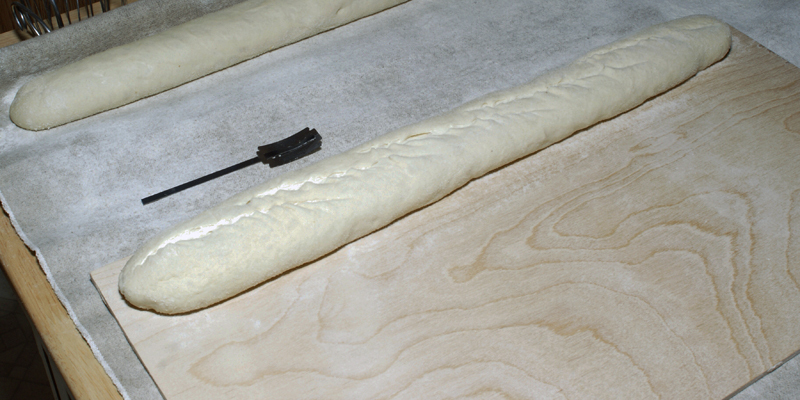 Chill the dough during autolyse, and return it to the chiller immediately after each manipulation, e.g., S&F. Here's a series of photos I took today of a 65% Hydration, 21 hour retarded baguette bake. I've documented my earliest attempts to make baguettes here http://www.thefreshloaf.com/node/16377/overnight-baguettes . It gives the 72% hydration formula I started with. Most of my subsequent many tweaks involved exploring hydration, and retarding effects. This is my post-retardation setup: I preshape the baguettes immediately and leave them to rest for 1 hour at room temperature. After 1 hour rest, I shape and proof the baguettes (seam side up). Proofing time today was 1 hour. Here is the second loaf, slashed, and ready for loading into the oven. After many attempts, with various commercial peels, to load baguette loaves either serially, or in multiples I've settled on loading them serially with a home-made peel--it's really just a scrap piece of birch plywood, cut 2" narrower than my oven. I also load sourdough loaves (2) side-by-side serially using the board held along the narrow side. It works better than any of the commercial peels I've purchased--including the Superpeel. I load the peel by simply flipping the loaf onto the rice flour dusted board, and slashing it. Then right into the oven, one at a time. 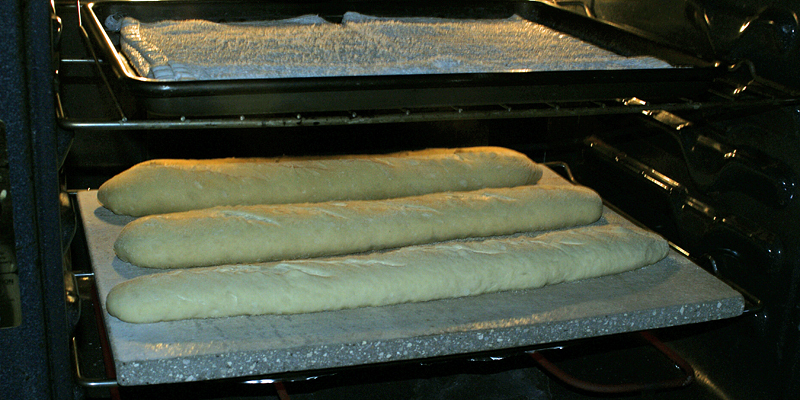 The oven, loaded to its meager capacity: 3 baguettes. You can see the only down-side to serially loading I've experienced. Oven-spring is already well underway in the first two loaves. On the top shelf you can see the way I generate steam: two wetted towels. SylviaH convinced me to try this approach, and after the first try I stuck to it, but I made it simpler than her method (involves heating towels in the microwave). I wet the towel with 2-3 cups of the hottest tap water. I put the wet-towel tray on the top shelf, and switch the oven control from "Convection Bake" to "Broil" at 550°F. I do this about 6 to 10 minutes before loading the first loaf. I can watch the wetted towels begin to bubble. I switch the oven to "Bake" (conventional, shutting off the convection fan) at 500°F. Finally, after all loaves are loaded, I decrease the oven to "Bake" 450°F. After 10 minutes I remove the steam pan, restore "Convection Bake", and finish the baking. Early in my trials I discovered the rear-mounted convection fan dried out the surface of the most rearward loaf, and inhibited oven-spring. That's why I do all the oven mode switching. Recall, this is a 65% hydrated dough. It's consistent open crumb like this that supports my arguement retarded fermentation supports open crumb development. So far, I've not lost sight of K.I.S.S. 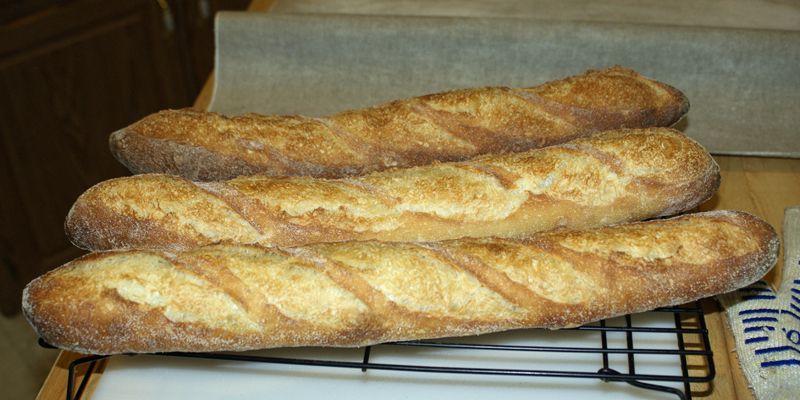 I bake baguettes once each week, so if you see where I can make it simpler, please comment. There is so much good information here for readers to digest. And your baguettes are so good; testament to why people should take note! Thanks for the fine praise. I've been following your most recent adventures with interest. There's a lilt in your voice, about your future, I'd previously only seen when you spoke about your students. Nice to see you focusing some of the optimism on yourself. David, those are splendid looking baguettes. I especially like not only the irregular and open crumb but the creamy color of the crumb, which indicates that you did not overmix your dough. Your point about hydration is well taken: a well mixed and shaped dough at a hydration of 65% or so can yield as open a crumb as one at 70% or more. And you are correct that a long fermentation develops flavor in baguettes (and similar breads) to their maximum. But you might also want to consider a shortcut that bakers have used for over a century: using a preferment. By utilizing a portion of prefermented dough (usually a poolish or biga) that contains a small amount of yeast, you can produce baguettes in 6 hours or so with the same flavor development as ones that have retarded for nearly 24 hours. For the home baker this might (or might not) matter so much. For commercial bakers, where space may not be available to retard large amounts of baguettes, preferments are a favored solution. That's a great suggestion. The first baguettes I ever made (3yrs. ago) were made with a poolish ala Ciril Hitz formula. That called for overnight fermenting the poolish. As a simply a home baker, the poolish' bowl took up as much room as the dough container for 3 loaves. You're right, however. If I were a commercial baker, doing hundreds of loaves, I'd be worrried about space. 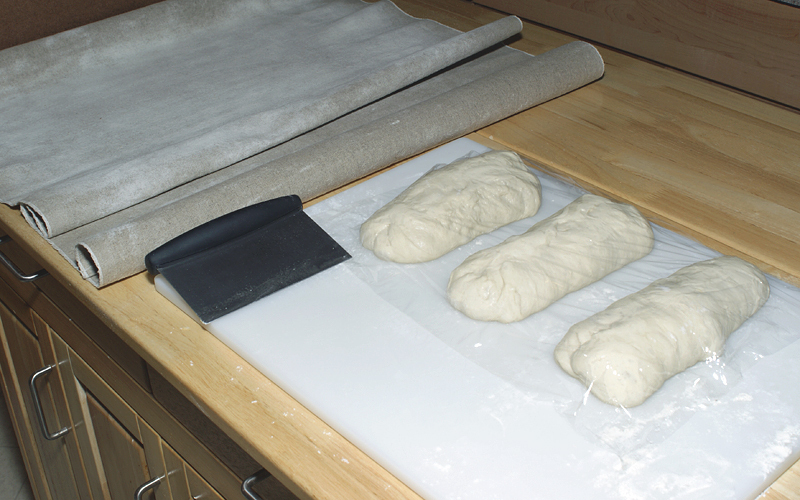 Poolish (or Biga) is a great space saver, and time management tool. I got the idea for fermenting the entire dough mass overnight from the David Snyder's post re Anis Bouabsa's baguettes, but I still have difficulty handling high hydration doughs (72% and up), so I've been exploring. 67%, and overnight fermentation seems to be my favorite niche. I did this at 65% because of the long retardation. I have tried 5 or 6 baguette formulas, including several leavened with sourdough, and I agree that the wheaty flavor is enhanced by yeast. My best success has been with proth5's formula, using a poolish and a small amount of ripe sourdough, too (http://www.thefreshloaf.com/node/21620/proth5039s-quotstarting-get-bearquot-baguettes). If you cold retard the dough, you get a great complexity of flavor, with just a bit of sour tang. If you don't cold retard, it's not sour at all, but you get a bit of extra taste. 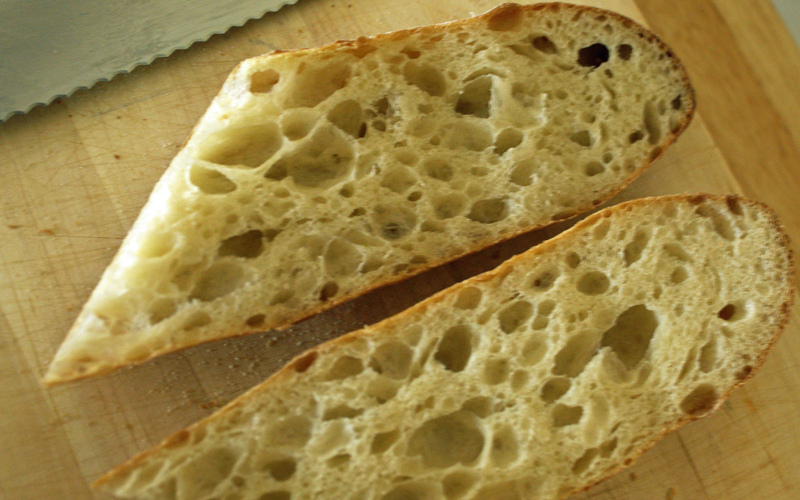 I also note that it is low hydration for a baguette, but has a nice tender, open crumb...like yours. I love--almost as much as I love baking--fly-fishing. But on a bad day, I'll still use worms. I made a mental note, quite some time ago, to try Pat's "Bear-stalking" baguettes, but I've never got around to it. I will. I'm sure we'll enjoy them. Nevertheless, I stick by my statement "...sourdough in a baguette shape." But that's simply my bias. I've been brewing beer for nearly twenty years. Brewing is analogous to bread baking. There are styles of beer wherein the ingredients, and processes are chosen so as to enhance one, or, at most, two of the flavor components integral to one or two of the ingredients. In other beers, a complex mix of flavors contributed by most or all of the ingredients are sought. A couple of examples: There is a wheat beer yeast that contributes an ester to the mix that dominates the flavor profile with a banana-like taste, Lambics are inoculated with a lacto-bacteria to give them a dominant sourness, fruit is sometimes added to give lambic beer a contrasting flavor. On the other hand, Barley Wine is a complex mix of barley malts, kilned at different temperatures, to provide differing flavors; lightly hopped most often with a bittering specie and a second flavoring specie , and usually fermented with two yeasts: one chosen for its flavor contributions, the second, introduced late during fermentation, for its alcohol tolerance and neutral flavor contribution. I think of baguettes akin to the the first examples, emphasizing, exclusively, the wheat flour's ferment-produced flavors. Barley Wines are the panettones of beer. I don't think commercial bread yeast enhances flavor. I think it stays out of the way of flavor development, i.e., is mostly neutral. It may have been engineered that way. I haven't been able to pin that down definitively. I think fermentation develops flavor (and other non-flavor related properties such as gluten structure). I think successful baking bread is finding the "sweet-spot" wherein a number of chemical processes, each working at a different rate, converge at a time to yield the most satisfying flavor, mouth-feel, and eye-appeal (I'm also a firm believer we begin eating with our eyes). I intentionally prefaced nearly all my remarks with "I think". I did that because I know I'm not certain of anything I write about baking. I am learning. "I'm also a firm believer we begin eating with our eyes." Reminds me of another enjoyable pastime. Fun is what it's about. I doubt many TFLers do this for pure science or nutrition. Great Lessons and Beautiful Baguettes. I really enjoyed the sharing of your experience in creating these loaves; lots of goodies are within your text. We all think nothing of converting a straight dough formula to natural levain; no reason we can't go the other way. You might be interested in this post http://www.thefreshloaf.com/node/24450/what-do-when-your-seed-starter-dies . Glad you enjoyed the write up. Happy IY Pain de Campagne! Great baguettes, David. And I concur with what you have discovered: you don't need a high hydration to produce an open crumb. A cool temp and a long fermentation and a very small amount (just enough to get the job done) of yeast produce exactly the same results, if not better. Great post with a lot of good information in it. I didn't mention the amount of yeast, I used only 3/8ths tsp of IDY in 1 kg of dough for this bake. I use 1/2 tsp when I retard only 15 hours. At 54°F I have dough that roughly doubles by the next morning, with these amounts. Great write up and baguettes, David G! Substituting sourdough levain for commercial yeast, makes a different bread. It's sourdough in a baguette shape. Delicious, sometimes, but not an accurate rendition of the modern baguette. Furthermore, sourdough levain masks the delightfully "wheaty" flavors a baguette can (and should) have. however, mishandling can massacre the gain. Not sure if you've ever read my recent blogging blathering about my meagre journey of 'finding my perfect baguettes,' but having experimented with very soft T55 several times seriously for the first time (have used it some years ago, but I wasn't so bread-obsessed as now, so I didn't really understand or notice fine differences in its behaviour a different flour made) and especially since attending French Baking course at Lighthouse Bakery School just a few days ago (will blog about it soon), I''ve been contemplating returning to French folding to proper gluten development, my old kneading method, rather than S & F in a bowl, but I was a bit worried that might lead to flavour deterioration because of more oxidation. But reading this entry and your formula, I'm more convinced now that I really should try that, at least once. Thank you for sharing your K.I.S.S.. I think you've helped me feeling more confident in retracing to my old route for a bit. Yes, I have to agree on the commercial yeast vs sourdough baguette thing, too. They are completely different beasts. And I find exactly the same: the sourdough masks that nutty/wheaty flavour. The soudough ones taste excellent in their own right but the ones made with commercial yeast remain my favourite. Which is odd because about 75% of the bread I make is made with sourdough. Yes, I read your recent blog, and empathized. LOL!! You made my day, truly! I'll join you in the oven if that's the fate we have to face. Lovely Baguettes. David!..nice results and beautiful open crumb for such a hydration,and considering the absence of a pre-ferment. By the looks of your formed baguettes, and your excellent scoring patterns, you should have had grignes across the slashes. 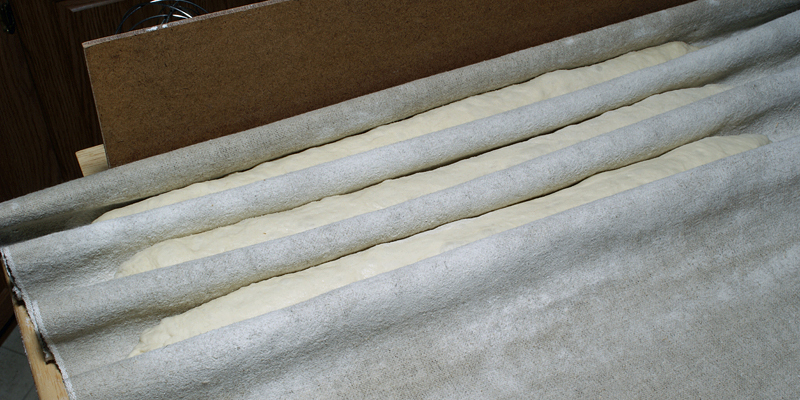 Having the tray of wet towels on top deprives the baguettes from top radiant heat, which is crucial for well defined scoring patterns, and oven spring. I usually place an oval semi-deep stainless steel dish with two small rolled towels beside one another, under the stone (at the oven floor). I drench the towels with boiling water, and load the dish 5 minutes prior to loading the loaves. It workes wonderfully. raise your stone rack to the middle so as to get even heat from top and bottom. Your comment about my steaming method blocking the radiant heat from above was an Ah-ha! moment. I've been wondering for a year (since I adapted this steaming method) why my scoring, especially in baguettes, seemed to be worse than originally. I've been attributing their poor showing only to my poor scoring skill. I'm going to try, next week, a modification that will, once again expose my loaves to the upper elements. I'm just getting about a 1/3 of photo on the finished baguettes...but, the crumb looks so lovely and delicious..these are the kind of baguettes I could really sink my teeth into :) Very nicely written-up. Thanks for sharing! My wife and I have developed a ritual: I bake three baguettes; when they're warm to the touch we devour one with a bit of butter, or nothing at all. I've been having to reload a lot of TFL pages, lately, to get pictures to load fully. I really like your list of principles. I hope new bakers get pointed at this topic, especially those who pride themselves on just throwing together their dough ingredients as the spirit moves them. I agree with most of your conclusions regarding flavor development, but I have some reservations about the best flavor coming from the use of commercial yeast rather than levain. I think a liquid levain kept at room temperature can result in a baguette with the flavors you describe. This is with a long room temperature fermentation, not cold retardation. Maybe the retarded dough would "win" in a side-by-side tasting, but I think it would be close. In any case, your KISS principles apply. I don't know what best flavor is. I was only making my point I like the intense wheaty-nutty flavor I've been able to achieve this way. Among the lean dough breads I bake it's unique. I've made this formula, at a slightly higher hydration, using liquid levain. I retarded the fermentation:15 hours. The loaves were delicious, but the wheaty flavor component, while present, was very muted. The flavor was similar to that I get, and like, with a 90/10: white flours/whole rye sourdough I make with liquid levain, but don't retard, at least not yet. I've been experimenting with retarding sourdough bakes. It's early days, but I'm pleased with the resulting flavors. Stay tuned. Flavour-wise, perhaps levain-based baguette may have more complexity than commercial yeast based with possibly more depth, too. But the biggest reason I stopped using sourdough in my baguette making was the texture; how much I tried, the resultant baguettes made with my starter were more like 'light sourdough bread' than 'baguette' that I'd known of; a little too heavy and too moist for my liking for baguettes with sturdier crust. The 'chew' was of different kind from the one you get from yeast-based & long fermented baguette crumb. Difficult to describe but sort of .....more resilient....a little stickier....? I have yet to use steam in any breads I bake for fear of either a. breaking the oven or b. seriously burning myself (I'm accident-prone). So this seems like a safe way to go! My only question is, how do the towels take it? Do you just reserve some towels as "steaming towels" or are they wet enough that the worst that happens is they get really hot? I'd love to know. Your baguettes look amazing, by the way!